You can test how our technologies work on iPads. Bring customers and users face augmented reality, virtual try-on and beautification experiences on tables. You can now overlay face filters and face modification effects on videos recorded previously. Desktop only. We’ve made our FaceAR platform smaller in size for 10%. We optimize space resources and power consumption without compromising on the platform’s performance. We’ve enhanced the photo taking experience for landscape mode. Augmented reality effects are processed faster during photo taking experience. Support for Action Units detection and Blend Shapes rendering allows creating your own animojis. You can now interact with filters and AR effect through multi-touch actions. This gives more freedom in designing gamified filters as users can have more than two points of contact with the screen and play with the effect. We trained a new neural network for eyes segmentation with better accuracy. We can overlay effects specifically on eyes e.g. shadows. You can process process the taken photos and fix face defects with better accuracy. 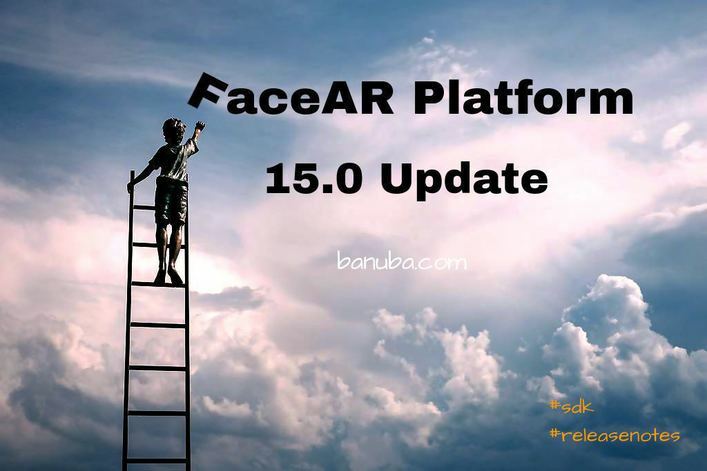 RAED ALSO: Face AR SDK 14.0 Update: New Features For You! Banuba Face AR SDK includes several components, i.e. Face filters, Beautification, Avatar and Face analytics. You can use each component separately to build a standalone augmented reality app or integrate it into your existing app. See how our Face AR SDK can help you to empower your app with some amazing features that your users will love.